It seems like yesterday (actually, it was two years ago at the 2011 International CES) when I first heard the Bryston BDP-1. A revolutionary 21st century digital music player, the BDP-1 had no moving parts to break down or to add noise. This clever component, coupled with an outboard DAC, played digital files of most currently available formats, whether stored on thumb drives or USB hard drives. Fast-forward to the present, Bryston has continued its efforts to improve gear that was already excellent. 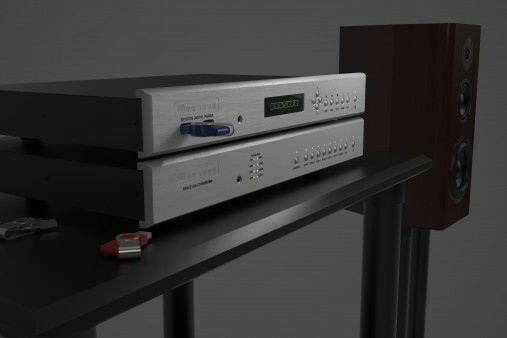 After recently reviewing the Bryston BDA-2 digital-analogue converter, I inveigled Bryston VP, James Tanner, to put me in the queue for their new digital player, the BDP-2. The front panel looks identical to its predecessor, starting with two USB 2.0 ports intended for thumb drives, an IR “eye,” a small screen that shows commands (when invoked), player status or current selection being played. Moving further right, there are four command buttons, followed by playback buttons (previous track, next track, stop, pause, play) and a power button. The biggest changes from the BDP-1 are found on the rear panel. 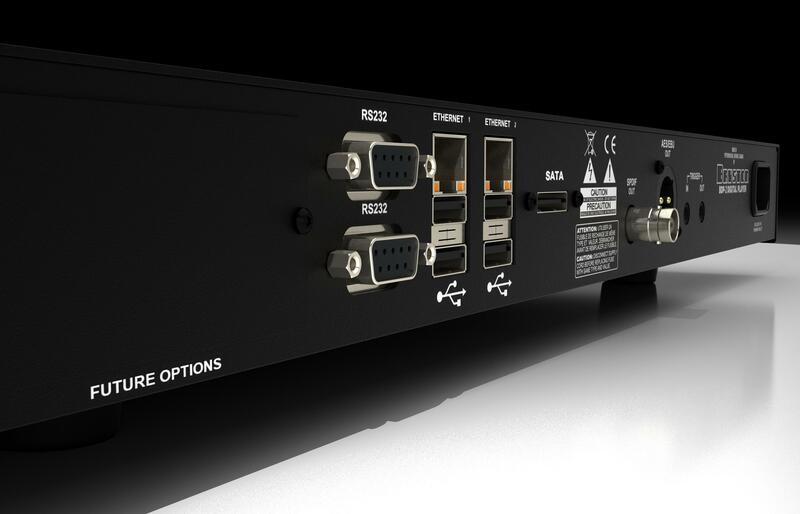 There are two (rather than one) RS232 and Ethernet ports, four (rather than two) USB 2.0 ports, and a new eSATA HDD connector. Similar to the BDP-1, there are BNC/SPDIF and AES/EBU outputs, remote on/off trigger controls, and an IEC power receptacle. Further improvements in the BDP-2 include a custom Intel Atom powered motherboard, an eight-fold increase in system memory, and a more robust power supply. Several remote operation options are available: the Bryston BR-2 multi-component remote control; PC/Mac programs (Bryston-Max, Bryston-Mini); Minion player (requires Firefox); i-Pod/Pad/Phone and Android apps (MPod). MPoD (music player daemon) uses the BDP-2 as a network server and searches libraries, sets up playlists, and controls playback functions. Dozens of audio file formats are supported including AIFF, FLAC, WAV, MP3, M4A (MPEG-4 Audio), and OGG. Firmware updates are accomplished via the internet by putting bryston-BDP-2.local in your computer’s web address bar and selecting the “firmware” option on the menu that appears. The update process is quite easy, and I updated successfully on the very first day of my evaluation. The BDP-2 must be initialized on each start up. This is a rather brisk process, generally taking less than one minute. The time-consumer is the “U” or update function that depends on the size of your library. The BDP-2’s added system memory is intended to help loading album metadata, a potential plus for those with large music libraries. By way of full disclosure, I do have a large, or should I say very large, music library with more than 4000 CDs stored as FLAC files, and several hundred high resolution files, ranging from 88.2 kHz/24-bit to 192 kHz/24-bit resolutions. I found the extra USB ports proved invaluable as I could use several smaller capacity HDs (500 gigabytes) rather than larger HDs (1 TB or greater) to load my music more quickly. The faster file loading was quite noticeable and quite welcome! The responsiveness of the BDP-2 to MPoD commands issued by my iPad was also impressive. Experimenting with BNC/SPDIF and AES/EBU ports (I did this previously with the BDP-1), I found the latter to be a tad warmer, but the former sounded just fine, so those whose DACs lack AES/EBU connectivity need not worry. With Bryston digital players, assembling playlists is easy, using MPoD or Firefox Minion to search out the tracks, adding them in any order, and saving them to memory. I am a voice freak and if vocal cuts do not sound close to the real deal, then there is no deal. I started with a frequently used test track, a 96/24 FLAC file of Esperanza Spalding and Gretchen Parlato, dueting on a catchy Brazilian number, “Inutil Pasaijem.” The BDP-2 offered up a transparent sound picture of two voices of similar timbre, but both easily distinguished from each other. Sultry Diana Krall’s “Peel Me a Grape,” also a 96/24 download sounded warm, breathy, and, oh so seductive. In Officium Novum, jazz saxophonist Jan Garbarek has teamed up with early vocal music specialists, the Hilliard Ensemble. Another 96/24 album, this is fascinating interplay between voices and sax that has an otherworldly acoustic, appropriate for its ancient religious songs. Score a 100 for the BDP-2 on this one as well. Tossing in a 192/24 download, the BDP-2 allowed me to revel in the remastered Tea for the Tillerman, with Cat Stevens’ voice, more holographic than I have ever heard it in its previous CD incarnations. But most of our collections are still plain-Jane FLAC files ripped from redbook CDs, a situation likely to persist for quite some time. The BDP-2 got a whole bunch of these recordings. Picking and choosing favorites among the many auditioned is like designating a favorite child, a difficult task at best. David Maslanka’s 1999 Wind Quintet No. 3, (Bis Records) is based on Bach chorales and performed by the Bergen Wind Quintet. This piece sounded magnificent with the physical air of these instruments perfectly recreated. A 1978 Telarc digitally recorded Stravinsky Firebird Suite, played by Robert Shaw and the Atlanta Symphony Orchestra was full-bodied, percussive, and, if not the best sounding of the many versions out there, still delivered visceral excitement loud (the brass and big bass drum) and clear (the strings and winds) through the BDP-2. As Bryston intends to keep both BDP-1 and BDP-2 players in their current line up, and as there is a noticeable price difference between them, a prospective buyer might ask the obvious question: What does the extra $800.00 get me? I hooked both units up through the BNC/SPDIF inputs on a BDA-2 DAC and constructed identical playlists on identical thumb drives, as level as the playing field will ever get. Getting straight to the point, and with both drives cued to the same cuts, I switched back and forth frequently but by the end of these A/B comparisons, I was unable to hear any audible differences between the two units. So, I posed the same question to James Tanner: who should consider buying a BDP-2? James agreed with my earlier observation. The BDP-2 would be the way to go for those like myself who have very large digital music collections. In such cases, the much greater speed of loading and retrieving files would be a definite benefit. The option of an eSata drive capability also makes sense for the same user group. The significantly greater memory has the potential for future-proofing the BDP-2 should new digital playback options come along. Listeners with much smaller collections, say on the order of a few hundred selections, would do as well sonically with the BDP-1 since the loading speed advantage would be less apparent or necessary. Small screen makes distance identification of source or function difficult. As more music is being downloaded from internet stores like iTunes and HDTracks, and as more of these downloads are available in higher resolution formats, listeners will have to decide how best to port these files to their audio systems. In the past, PCs or Macs were the only alternatives but their soundcards were often disappointing and failed to take advantage of the recordings’ higher resolutions. Freestanding music servers like the Meridian Sooloos or the Olive Media series changed the game by enabling mass storage of music files, rapid track access and ease of operation. Their large storage systems were either NAS hard drives (Sooloos) or internal HDs (Olive). When Bryston introduced its BDP-1 player, another element was added, the portability of music files through thumb drives and external HDs. This meant that you could swap your own digital sources or add the external drives of friends who might drop in to listen with you. The BDP-2 has all of the sonic virtues of its predecessor with the additional ability to handle more external devices, including high capacity eSATAs, with faster loading/retrieval speeds. 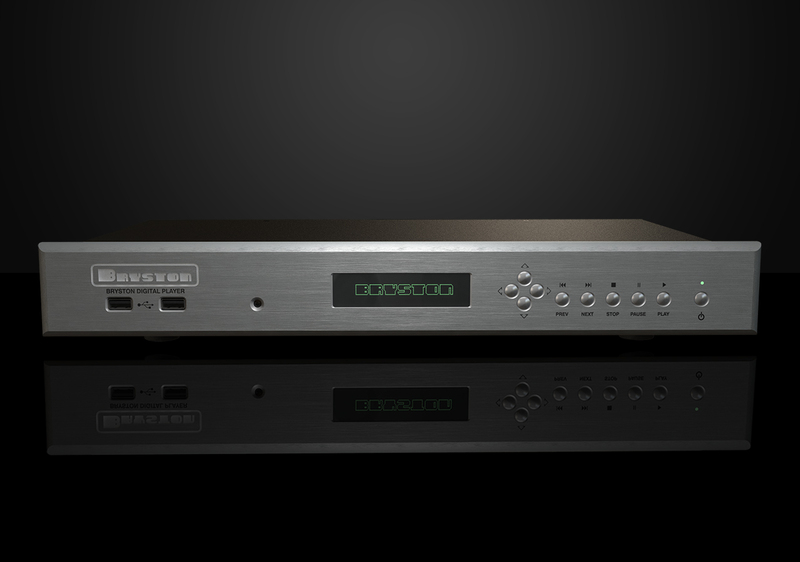 The BDP-2 offers listeners with ginormous digital libraries much faster loading of their music files. If this feature and the advantage of enhanced system memory are important to you (as they are to me), then the BDP-2 becomes the logical next item on your need-to-own component shopping list.